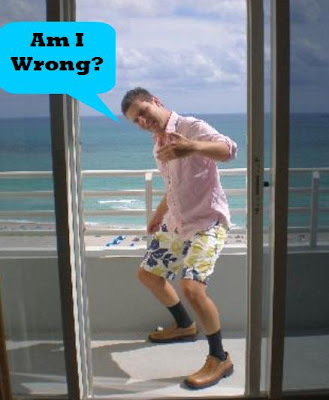 It’s time for another installment of Am I Wrong?. You know you love it. I don’t like the song “Unforgettable” by Nat King Cole. So when I’m walking down the street on my way to work and you’re playing it on your flute and then give me a dirty look when I won’t tip you for it, don’t be surprised. If you’re unlucky enough to be homeless, yet lucky enough to own a flute, learn a new song. Perhaps something by “The Shakira?” Am I wrong? If you’re walking around the streets of New York with your camera around your neck, plastic map in your hand, and socks crammed into your sandals, please save the muggers the time and just hand them your money. Don’t make them try to trick you, just hand it over. Actually, while you’re at it, be nice enough to provide them with your mother’s maiden name and the last 3 digits of your social security number. Am I wrong? Enough about Global Warming. I’m fine with it, really. So it gets a little warmer. As long as there’s a nice breeze I think it actually sounds kinda nice. Ok, so the lakes and rivers dry up. You know what, this won’t effect my life though right? It could effect my kids lives or their kids lives. That’s not my problem. My parents and grandparents didn’t do anything to slow down the hole in the ozone layer and that seems to have fixed itself. I’m sure Global Warming will go away once El Nino comes back. I have no clue. Am I wrong? Who’s on CraigsList? Let me tell ya, trying to sell your car on CraigsList really brings out the crazies. No I won’t “trade” you my 1998 Acura for your 1997 Honda Civic. Are you kidding? Oh, and “no” I won’t let you have the car for only $3,000 because that’s all you have saved. Did you not notice I was asking $7,000 for it? No deal. And this isn’t The Price is Right. Just because you “name the price” doesn’t mean you get to have it for that price. Buy a bike instead. It’s cheaper and with your left over money, buy crack. Am I wrong? Stop tipping yourself. When I buy my coffee for $2.75 and hand you $3.00, don’t take that change and toss it in your tip cup as opposed to giving my my change. Sure, I would have probably given you that anyway, but now that you seem to assume I would have given you that change I want you to dig your grubby little hands into your “tip cup” and give me back my 25 cents. You get nothing for being cocky. Am I wrong? Why does every convenience store or drug store seem to have some type of “discount card” that they always ask me if I have it when I’m about to pay for my stuff. “Do you have a discount card?” I answer “no.” They reply, “Oh, would you like to open one?” I say “no thanks” and then the conversation ends. Why do I need a special card for this? Just give me the 4 cents I would save on my toilet paper and send me on my merry way. You know what? Next time I’m about to pay I’m going to ask them, “Do you have a ‘more money’ card because if you do I’ll give you more than the total.” I think these register workers are just on a power trip. Am I wrong? Am I Wrong? Rant You!